After graduating from the Kogan Academy of Dramatic Arts in London in 2012 Jenný Lára Arnórsdóttir returned to Iceland to base herself in Reykjavik. Successfully gaining funding from the Aftur Heim grant scheme brought Jenný Lára to work in North East Iceland where she grew up. Aftur Heim funded Jenný Lára to work on her idea for a theatre production based around local people’s love stories. This solo theatre performance featured six characters and was developed using the verbatim method using interviews with local people and exact words spoken to develop the script. 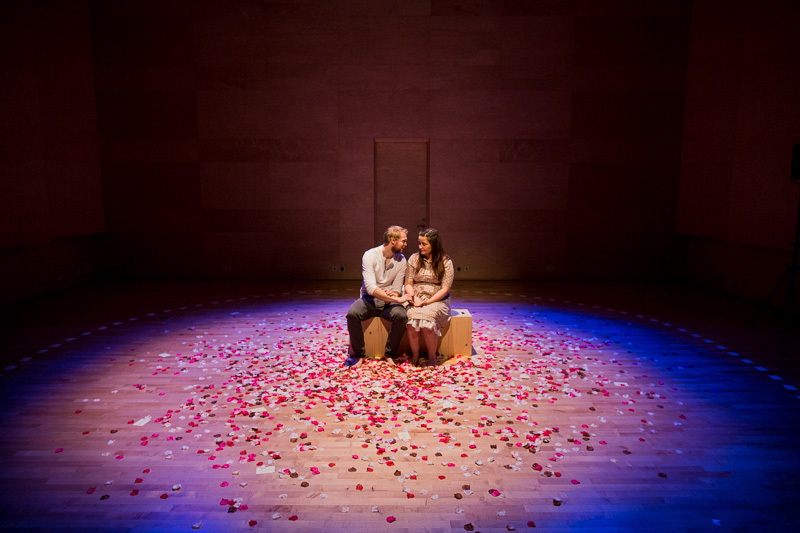 Love Stories has been performed in communities across the North East region as well as in Reykjavik. It has been reimagined as a bigger production which ran in the Hof Culture House in Akureyri in 2016 and the Berg Culture House in Dalvík in 2017. Jenný Lára also aims to continue to tour with the production, she explains: “We have been thinking about taking it to some international festivals. We have gotten some really nice feedback so we want to continue with it”. The Aftur Heim grant scheme was important to help Jenný Lára build connections in the North East region, opening doors towards new projects and roles. “That is what made me start to come up north. People started noticing me and what I was doing. I got two directing jobs because of that and in the end I was getting more jobs up north than in Reykjavik” says Jenný Lára. Another of Jenný Lára’s productions is ‘The Hidden People’, based on local elf folklore and supported by the the Mývatn Cultural Centre. This production aimed to tap into the growing numbers of tourists visiting the North East Iceland region and was staged in Dimmuborgir, an area with large, distinctive lava fields, also near Mývatn lake and conservation area. Jenný Lára learned the importance of planning to effectively tap into the tourist market: “With tourism you kind of have to start a year before you are going to do the show, because people are booking these things quite far in advance”. Collaborations with local and international partners have also been an important part of the Artik Theatre Company’s work. The international co-production Culture Bus was an Icelandic-Norwegian production involving a grant scheme similar to Aftur Heim in Norway. Jenný Lára has worked on projects with other local actors and writers, as well as theatre companies such as the Akureyri Theatre Company. Jenný Lára Arnórsdóttir has a range of experience and not just on the stage. She has also acted in feature films such as the Oscar nominated Icelandic drama Rams, released in 2015. Also part of Jenný Lára’s collaborative work is being part of a campaign to raise awareness of the quality and quantity of professional creative projects happening in rural and peripheral Iceland. Both within and outside Iceland, Reykjavik tends to be seen as its creative centre, but the countryside also has creative talent that could be better highlighted. Jenný Lára explains: “When you have a theatre company up here people think it is an amateur theatre company but don’t realise that you actually studied it, you are doing shows and making a living off it…theatre groups outside Reykjavik find it hard to get critics to come from the press…we want to bring awareness to the fact that there are a lot of projects happening out in the countryside”. Artik Theatre Company also plays a role in bringing genres to North East region that local audiences have had limited chance to enjoy, such as opera. Last year it produced an opera by an Italian-American composer. “It is called the old maid and the thief. Not a lot of operas have been put on here so we are kind of introducing that genre to the people” says Jenný Lára. With the Artik Theatre Company now based in Akureyri, Jenný Lára’s work further strengthens the creative resources in the North East Iceland region.